Unlike a laptop, a Windows 8 tablet doesn’t have a built-in physical keyboard. Instead, you touch the screen to do something. While working in OneNote for Windows 8, you’ll notice round icons appearing in your notes. These icons show up when you tap notes or objects on a page, select text or pictures, or do other things in your notebook. When you tap these types of icons, a radial menu appears — showing you a wheel of commands for what you’re working on or what you currently have selected. The commands on these menus change, depending on what you’re currently doing. For example, while typing text, the radial menu for page commands appears, giving you quick access to familiar commands like Undo, Copy, or Paste. When a round menu icon appears in your notes, tap it to expand its commands, and then tap the icon of the command you want to use. For example, to correct a mistake you’ve made while typing, tap the Undo icon to remove your mistake. 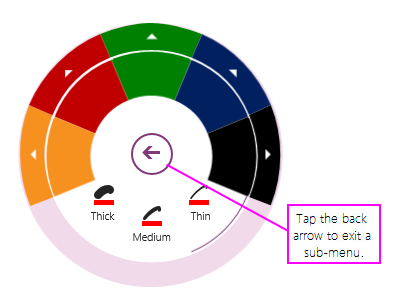 If an arrow appears on the outer edge of a radial menu next to a command icon, it means that more choices are available for that particular command. Tap the arrow to show the additional or related options. When you’re done with a radial menu, tap the round icon in its center (the same icon you tapped to open the radial menu). If you have a keyboard connected to your tablet, you can press ESC to dismiss a menu. If you’re in a sub-level of a radial menu and want to go back to the main level, tap the Back arrow in the center of the menu. Alternately, you can press ESC on a keyboard to do the same. To quickly activate any of the top-level commands of a radial menu without first opening it, use your finger to swipe around its icon on the screen without first tapping it. As you swipe around the icon, a tooltip appears to confirm the command that will be applied as soon as you take your finger off of the screen. When you use commands on a radial sub-menu, the commands you used last will automatically replace the default command icons that appear on the main level of that particular radial menu. For example, if you use the Important tag, it will replace the default To Do tag icon the next time you open the radial menu that contains the Tag command. If you’re having trouble finding a particular menu or menu command, try tapping or selecting part of a page (or an object on the page) in your notebook that you want to interact with. If another radial menu is already open, be sure to close it first. 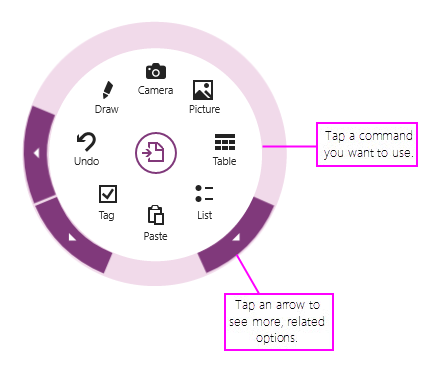 In addition to the radial menu commands, OneNote also supports a number of keyboard shortcuts that can help you navigate and control your notebooks more quickly. 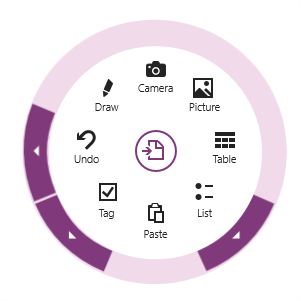 For more information, see Touch gestures and keyboard shortcuts in OneNote.